Tag Archive | "assignment of mortgage fraud"
Department, sent a notice of delinquency to Paneth at the Premises address dated November 16, 2008. No mention is made therein of an assignment of the mortgage by Fairmont to Wells Fargo. In fact, no mention is made at all of Fairmont or MERS. By “Assignment of Mortgage” dated March 13, 2009, some four months after the Wells Fargo notice of default, MERS, as nominee for Fairmont, assigned the mortgage to Wells Fargo. This action was commenced by Wells Fargo on March 16, 2009. Pursuant to the affidavit of service dated March 19, 2009, Paneth was served by personal delivery of the summons and complaint at the Premises to one “Hanna Paneth – Spouse.” Service was completed on March 23, 2009 by mailing of a copy of the summons to Paneth at “his last know address”, the Premises. Upon the expiration of defendant’s time to answer, an ex parte Order of Reference was granted by the Court on October 6, 2009. Thereafter, a Judgment of Foreclosure and Sale was executed by the Court on May 24, 2010. A foreclosure sale was then scheduled. Whether or not, as Paneth contends, he was properly served with process, the Court finds merit to the application for the reasons herein stated. Although the notice of default, a contractual condition to acceleration of the mortgage, was sent to Paneth at the proper address, the Premises, Wells Fargo has failed to establish that the notice of default was sent by the then proper party, Fairmont, or a then duly and properly authorized agent (see, HSBC Mortg. Corp. (USA) v. Erneste, 22 Misc.3d 1115(A)[Sup Ct, Kings County] citing Manufactures and Traders Trust Co. v. Korngold, 162 Misc.2d 669 [Sup Ct, Rockland County] and QMB Holdings, LLC v. Escava Brothers, 11 Misc.3d 1060[A][Sup Ct, Bronx County]). ORDERED, that the case be and is hereby dismissed. The foregoing constitutes the Opinion, Decision & Order of the Court. HON. LEWIS J. LUBELL, J.S.C. Law firm Shapiro & Fishman has accused Attorney General Bill McCollum of pre-election grandstanding and “abuse of power” in connection with McCollum’s recent announcement that his office is conducting a foreclosure fraud investigation into that firm and two others. The allegations are in response to a coordinated investigation announced by McCollum during an Aug. 10 press conference. 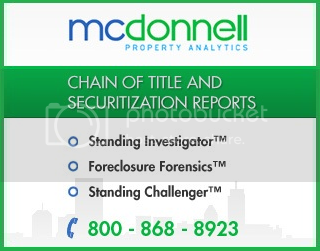 McCollum said his office is looking at whether the three South Florida firms engaged in unfair and deceptive actions in their handling of foreclosure cases. The other firms were the Law Offices of Marshall C. Watson in Fort Lauderdale and the Law Offices of David J. Stern, P.A. in Plantation. The firm’s response came Friday in a motion to quash a subpoena in Palm Beach County Circuit Court. “As a result of this economic crisis and political climate, politicians have joined in the blame game in an effort to demonstrate their concern for ‘consumers,’” the firm’s petition states. The petition said the attorney general’s news release mentioned issues that are not even covered in the state’s subpoena, and that the subpoena is overly broad – requesting documents apparently unrelated to the investigation. DinSFLA here: In my opinion this is trying to throw the towel and put the spot light on McCollum even when this was an investigation prior to…The AG did not instigate The Class Actions currently on the table against DJSP. It is the AG office job to protect the public and to look into the matter of the fraud that is coming out of DJSP and the other mills. Fla. AG Probe: Did 3 Law Firms Get 1,000s of Foreclosure Judgments By Possible Wrongdoing? “On numerous occasions, allegedly fabricated documents have been presented to the courts in foreclosure actions to obtain final judgments against homeowners,” says a press release from Attorney General Bill McCollum announcing the investigation. “Thousands of final judgments of foreclosure against Florida homeowners may have been the result of the allegedly improper actions of the law firms,” it continues. He also wondered aloud whether McCollum, who is a Republican candidate for state governor, could have been influenced by political considerations. On Tuesday the Florida Attorney General Bill McCollum’s office announced an investigation of Three South Florida law firms. The firms are identified as The Law Offices of Marshall C. Watson in Fort Lauderdale; Shapiro & Fishman, which has offices in Boca Raton and Tampa; and the Law Offices of David J. Stern, P.A. in Plantation. It is alleged that the firms, which were hired by loan servicers to begin foreclosure proceedings when homeowners were behind on their mortgages, may have fabricated mortgage assignments in order to speed up the foreclosure process. “Thousands of final judgments of foreclosure against Florida homeowners may have been the result of the allegedly improper actions of the law firms under investigation,” said McCollum, who is running for governor. McCollum said his office also is looking into whether the firms created affiliated companies outside of the U.S., where the allegedly false documents are prepared. “We are seeing a paperwork trail where law firms, through a mill, prepared paperwork with signatures from lenders who had assigned the mortgage,” he said. All they have to do is look into several blogs and attorney sites to see the evidence of fraud including this one. 1. A list of all employees, independent contractors and/or subcontractors of the Law Offices of David J. Stern (DJS) for the past 5 years (former and current employees, independent contractors and/or subcontractors) including their job title(s), their duties and responsibilities and the length of their employment with DJS, including any contracts DJS has or had with them. 2. For the past five years, the names and addresses of any and all lawyers and/or law firms that DJS hires/uses throughout the State to represent their clients in foreclosure cases and in what capacity said lawyers/law firms serve DJS, including any contracts between DJS and the lawyer(s) and/or law firm(s). 3. The names and addresses of the lending institutions that DJS has represented in foreclosure cases over the past 5 years, including any contracts between DJS and said institutions. 4. The names and addresses of any and all companies used by DJS to draft and/or execute Assignments of Mortgage or Affidavits for the past 5 years, including any contracts between the lending institutions and DJS allowing for the use of the companies to draft and/or execute said Assignments of Mortgage. 5. The names and addresses of any and all persons and/or companies hired and/or used by DJS to perfect service of process on foreclosure defendants for the past 5 years, including their relationship to DJS and/or David J. Stern, individually including any and all contracts between the person or persons and/or company and DJS. 6. The names and addresses of any and all servicing companies DJS represents or represented for the past 5 years. 7. For the past 5 years, the names and addresses of any corporations, companies, partnerships or associations that David J. Stern and/or DJS has any interest in, including any foreign corporations, and detail what the business does and what type of interest is held by Stern and/or DJS. 9. List all notaries for the past 5 years that worked or works for DJS who notarized Affidavits as to fee and Assignments of Mortgage, include their names and addresses. 10. Copies of all non-disclosure agreements that DJS has or had over the past 5 years with any and all of its employees, subcontractor or independent contractors. 11. Copies of all checks and/or evidence of any other form of payment(s) from the plaintiffs that DJS represents in court in foreclosure cases to DJS and/or any of DJS’s affiliates and/or subsidiaries for services rendered in foreclosure cases. 12. Documents, including emails, that evidence what the pay scales, pay grades and/or bonuses paid by DJS to employees, subcontractors or independent contractors for completion of foreclosure cases within a certain time period. I had the pleasure to meet Mr. Trent this afternoon and all I can say is he’s aggressive and determined to get the truth out! Here is another Deposition Via Kenneth Eric Trent Attorney at Law Fort Lauderdale Florida.